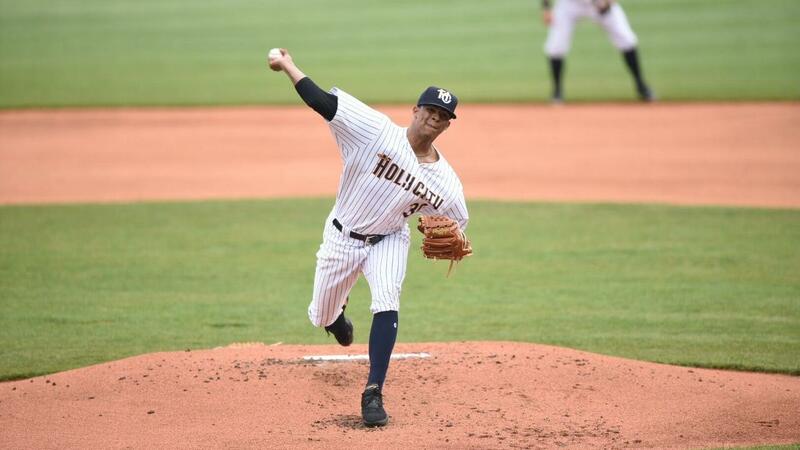 CHARLESTON, S.C. - The RiverDogs' inaugural home series of the 2019 season ended on a sour note Sunday evening, as Charleston dropped the final of four games against the Greensboro Grasshoppers, 11-2, for their second straight series loss in front of 3,378 at Joe Riley Park. It looked good for the Dogs (5-6) early, after right-handed starter and Yankees' No. 11 prospect Luis Medina used his overpowering fastball to strike out three straight Grasshoppers (6-5) in the first inning following a leadoff walk to second baseman Ji-Hwan Bae. Charleston broke their stretch of 11 consecutive scoreless innings in the home half of the frame. A leadoff walk by center fielder Brandon Lockridge and a bunt single by second baseman Kyle Gray set up a prime scoring opportunity for Friday night's hero Josh Breaux. He popped out to first base on the infield fly rule, but Eric Wagaman and Nelson Gomez came through with an RBI single and sac fly, respectively, to put Charleston on the board 2-0 after one. The wheels came off after the promising start, though, as Medina, Rodney Hutchison and Aaron McGarity combined to give up at least one tally in six of the next seven innings, including a brutal sixth inning that saw five Grasshoppers cross home plate. Medina didn't have the bounce-back start he was looking for after his two-inning, ten-run outing in the first game of the doubleheader in Asheville on April 9. He needed 72 pitches to complete three innings, giving up two runs (one earned) on three hits, in addition to issuing three walks and striking out four. Medina's three free passes added to a total of seven allowed by Charleston pitchers. His short start gave way to an already over-taxed bullpen, which had actually pitched a third of an inning more than the starters entering Sunday night's game (41.2 to 41.1 innings). Hutchison gave up eight runs in 2.2 innings of work, and McGarity allowed the final marker in the eighth inning. Adonis De La Cruz was called on to get the last two outs in the top of the ninth. Greensboro starter Braeden Ogle and relievers Nicholas Economos and Nick Mears held the Dogs off the board for the final eight innings, allowing just two hits the rest of the way. The loss marked Charleston's fourth blowout defeat of five or more runs through the first 11 games this season. On the bright side for the RiverDogs, Sunday night saw the end of Charleston's three-game streak of 10-plus strikeouts. Sunday evening's contest was fun for the kids and easy on the wallets. For Kids' Opening Day on an MUSC Health Family Sunday in association with Y102.5 iHeartRadio, ABC News 4 and the Charleston County Park & Recreation Commission, the youngsters in attendance enjoyed free food, and many of them came on the field to run the bases after the game. To top it off, all fans were able to park for free. The Greenville Drive make their first trip of the season to Joe Riley Park to begin a three-game series Monday night. The Drive are coming off a series loss to the Rome Braves, punctuated by a 7-8 loss Sunday afternoon. Alexander Vizcaino will make the start for the Dogs, his second of the season. Last time out, Vizcaino shut the Columbia Fireflies down on the road, to tune of 4.2 innings of one-run ball, allowing three hits, two walks and striking out seven. Facing off against Vizcaino will be right-hander Alex Scherff, making his second start of the season after hurling five shutout innings against the West Virginia Power, allowing two hits and one walk against four strikeouts. For those that can't make it to Riley Park, catch the game on "The Big Talker" WTMA 1250 AM, online streaming on the TuneIn Radio app and on MiLB.tv with a subscription. Fans can "Make Fun" with the RiverDogs all season long down at The Joe. Single-game tickets, including options to the Riley Park Club, are available at riverdogs.com/tickets or by contacting the RiverDogs front office at 843-577-3647 (DOGS). A full schedule and list of game times for the 2019 season is available at riverdogs.com.